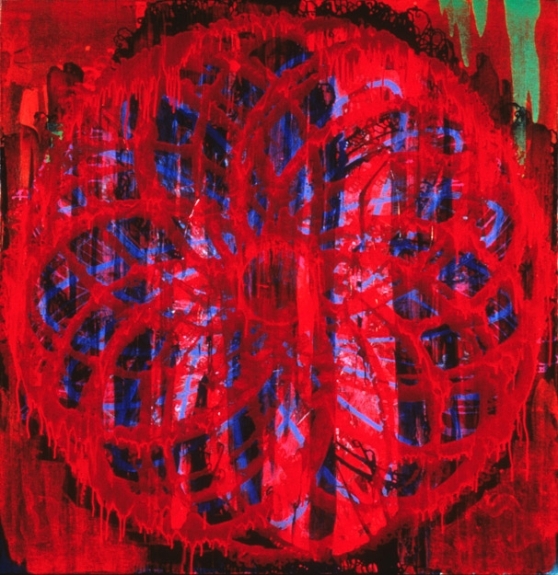 Seven "Trochoid" paintings, dated 1999, were exhibited together at Greg Kucera Gallery, Inc., in April of that year. The earlier rotary paintings were produced on a rotating easel, which facilitated the creation of very fine, even concentric circles. The trochoid paintings were conceived to produce a more complicated linear curve, using a hand-built motorized easel that allowed the canvas to rotate while simultaneously orbiting a fixed point. A trochoid (technically, a hypotrochoid) is the curve produced using a children’s drawing toy called Spirograph. While the mechanical easel served its purpose, the subsequent addition of surface ornament-- “corrective” blocks of color, dots, and other painterly interventions-- pushed the series beyond its roots in a technical problem and towards free-spirited exploration of pattern and decoration. The two final works in the series, Bloom and Camouflage (both 2000), were so uninhibitedly decorative that a step back was deemed necessary; the first reductive watercolors of that same year were intended as a rejoinder to this work. Sugar Sugar 1999. Oil and alkyd on canvas, 61 x 60 inches. Private collection.